Are you looking to modernise your garden? EdenRose Landscaping use the highest quality decking in Yateley, Surrey, Berkshire & Hampshire, their team will build a stunning decking area for your garden. Do you need replacement block paving or a new patio? EdenRose Landscaping offer a fantastic range of patios in Yateley, Surrey, Berkshire, & Hampshire. Whether you are looking for a natural stone patio or concrete paving, EdenRose Landscaping can change your outdoor living space. Looking for driveway solutions for your home or business? From block paving to tarmac, EdenRose Landscaping transform driveways throughout Yateley, Surrey, Berkshire, & Hampshire. Do you need new garden fencing? EdenRose landscaping offer good quality fencing in Yateley, Surrey, Berkshire & Hampshire. They have lots of fencing options on offer including wooden garden fencing, metal fencing, gates and much more. Are you looking to enhance the beauty of your garden with a pond or water feature? EdenRose Landscaping install ponds & water features in Yateley, Surrey, Berkshire & Hampshire. From waterfalls and rockeries to traditional ponds and water fountains, EdenRose can create the perfect outdoor living space. 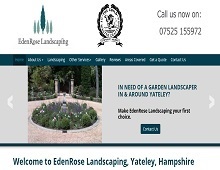 Contact EdenRose today, for affordable landscaping in Yateley, Surrey, Berkshire & Hampshire!